Did you know? Laminating pouch thickness is measured in Microns (1 micron = 1000th of a millimetre). It’s simple really; the thicker the laminating pouch, the more rigid the final result and the greater protection it will provide. The most common laminating pouch finish is gloss, an extremely versatile finish that is suitable for most lamination applications. Pouches are also available in a matt finish which is more ideal for applications such as menus, as the professional looking matt finish is less reflective and therefore easier to read. High quality A4 laminating pouches designed specifically for the home and small office user. Made from a high plastic composition for a firm glossy finish. Pouches are 80 micron thickness. Pack of 100 gloss finish laminating pouches. High quality A3 laminating pouches designed specifically for the home and small office user. Pouches are 125 micron thickness. 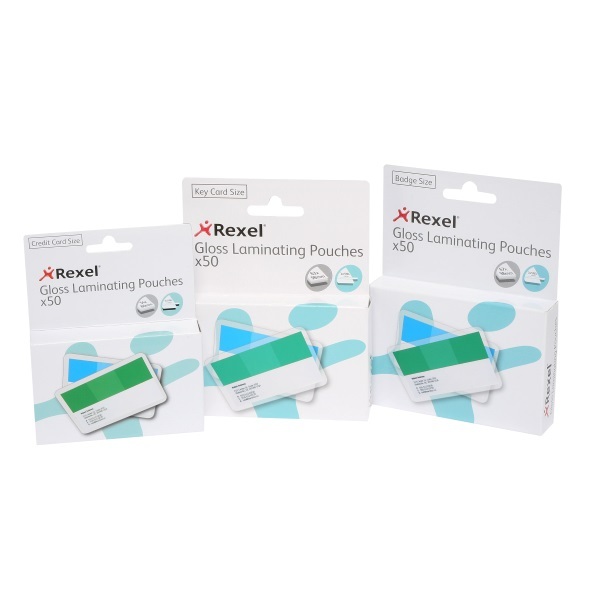 Convenient pack of 25 gloss finish laminating pouches. Pack of 25 gloss finish laminating pouches. High quality key card size laminating pouches designed specifically for the home and small office user. Pouches are 175 micron thickness. High quality credit card size laminating pouches designed specifically for the home and small office user. Premium quality high gloss small lamination pouches for that professional touch. Protects, preserves and enhances contents. Pack of 50 laminating pouches. Ideal for use with business cards, library cards and other membership cards. Pouches are photo safe and are clear once laminated. Size - 61 x 98 mm - Business Card size. Pack of 25 self laminating pouches.